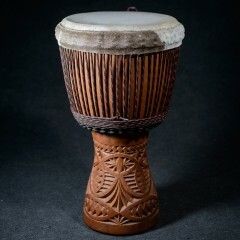 At djembemafia.com we sell exlusive and premium quality djembe drums and other musical instruments from west Africa. Every single djembe drum or djembe drum shell is carefully hand selected and custom built. All carvings on djembemafia drums are result of the work of the best malian and guinean carvers up to date. All shells are transported to the Czech Republic where are finished with maximum care and love. Using the best material and technical enhancements as multiple oiling, waxing, clearing, best possible ropes and others, brings you the absolutly unique and unmistakable hitches designs, look and sound quality! I select carefully each goat, calf or cow skin specifically for each djembe shell to achieve the best sound and design results. I use only the best pre-stretched high firmness and low dilatability ropes. All djembemafia made djembes last high tune and great look much longer than other lower quality ropes usually used on the most of other djembes. Unique and original hitches designs are unmistakable signature of djembemafia drums nad makes every single piece rare original in the highest quality. Premium Line djembe drums are finished only by Djembemafia.com. Several oilings and polishing, waxing, un-stained rings, only the best pre-stretch ropes, hand selected premium goat and calf malian and guinean skins, perfect sound, the highest artistic quality carvings, all kinds of mahagon wood, custom build djembes and absolutely unique design and unbeatable finishing quality above all. That all has each Premium Line djembe drum! Premium Line djembes are finished with maximum care, consistence and creativity. Djembemafia Premium Line djembes are unbeatable design, sound and quality! In this category you find djembe drums made and finished in Africa. Same as drums finished by me, are these drums made and skinned with maximum care and professionality. They don´t have djembemafia original hithces designs, pre-stretched ropes, colour combinations, hand selected skins to each djembe shell, rubber bottom, waxing etc. Npne of these facts doesn´t lower their beuty, professionality and strong clear sound. Same carvers works on Premium and Import Line djembe drums. All Import Line djembes are, compared to other djembe drums, mounted using high quality european ropes. 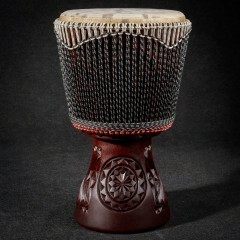 All mentioned differences between Premium and Import Line djembes are displayed in price. Welcome new line of professional djembes sold for the same price as the others do, but providing you with much better sound and overal quality! Here you find L size djembe drums with aproximate dimensions 30 x 55 cm (12" x 22"). 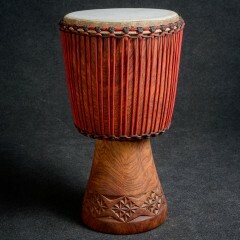 If not written else, all L size djembe drums are made from hard mahagon wood. All djembe drums are carved by master carvers from Mali and Guinea. Unlike other imported djembe drums, are our L size djembe drums mounted using only high quality european ropes which, in combination with perfect goat skins, provides you with real strong and clear sound. Thanks to top finishing and crafting process you will play all three basic tones with ease. L size djembe drums are perfect choice for beginner drummers, kids and even adult players who doesen´t need a big drums.